Some information out there says teeth whitening is unsafe and it can even damage your tooth enamel. This myth is simply untrue. Many studies have shown that whitening is safe when conducted by a dental professional. Be on the look out for retail locations offering whitening without a dentist or dental hygienist because they are not trained to offer whitening and you could harm your teeth. Some people think if they have their teeth professionally whitened, their new radiant smile will be white forever. Although your teeth will look a lot better than they originally did for the near future, most patients whiten their teeth every few months for an update. 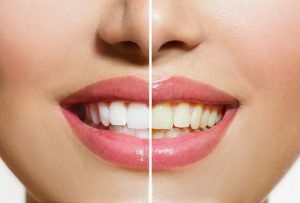 After whitening, your teeth will still be susceptible to stains and discoloration, which has made whitening schedules for patients quite popular. Thanks to Youtube and the rest of the internet, many people are sharing their teeth whitening secrets whether they’re myth or fact. One of the Do-It-Yourself tips that has garnered a lot of attention is that rubbing fruits like strawberries, lemons, and banana peels on your teeth can remove stains. Not only will this be ineffective in whitening your teeth, but it could also cause your smile damage. Acids found in fruits actually wear away your enamel and causes yellowing and discoloration. Another whitening craze found on the internet is using active charcoal to whiten teeth. There’s not enough scientific evidence to support this myth as an effective and safe whitening method. Your dentist can recommend over-the-counter whitening treatments for at-home use instead. Your oral health isn’t worth the risk of trying something that isn’t backed by scientific evidence and dental professionals. Talk to your trusted dentist about which whitening treatment is right for you and address any questions or concerns you may have about alternative whitening methods for an expert opinion. Dr. Chitra P. Naik has been providing quality care to her patients in Flint for decades. She is a member of several organizations, including the Michigan Dental Association to stay up-to-date on all the latest dental techniques and technology. She understands the look of your smile matters just as much as its health, which is why she offers in-office whitening. She currently runs her own practice where she can be contacted through her website or by phone at (810) 235-5422 for any questions you may have. by: Dr. Chirta Naik at October 8, 2018 .